Gili meno is one of the three famous Gili islands in Lombok, which is lies between the two gilis, Gili Trawangan and Gili air. Gili meno is the smallest island in between gili Trawangan and gili Air which has a length of 2km and 1km wide, with only has 400 population, so that the island is often referred as a remote island, but the beauty of the beach in gili meno is not inferior to the other two Gilis, the sand road leads all the way around the island. Most of the tourist facilities, including the boat arrival and departure point are on the southern part of the east coast. 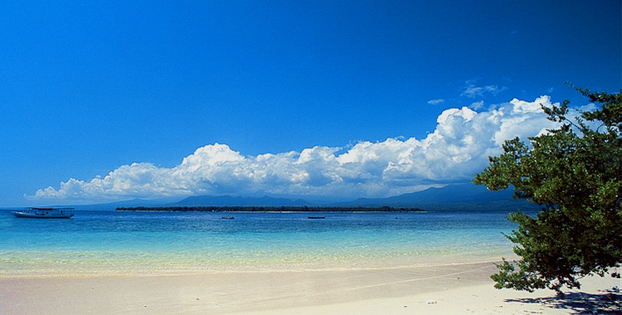 There are not too many activities to be found on Gili Meno, which is part of its appeal. Those who simply cannot refrain from some form of activity will find the Bird Park in the center of the village an entertaining distraction for a morning or afternoon. The Gili Meno bird park hosts over three hundred birds in a natural, free environment. Peafowls, Pheasants, Hornbills, Eagles, Pelicans, Macaws and parrots galore are amongst the feathered citizens and ambassadors gathered from all over the world. Accommodation is also to be found on site but most make the trip for the guided tour of the park, restaurant and pool table. The most popular stretch of sand on Gili Meno is to be found to the left of where the boats pull up on the beach. This southern beach strip is where the majority of accommodation getting there beach life on the island is to be found. There are no hawkers to disrupt a day’s sunbathing and the beach huts lining the sand offer a perfect respite from the heat where visitors can buy drinks and snacks from the neighbouring warungs. Snorkeling equipment can be hired from any of the local operators. Swimming is perfectly safe in the calm waters here but don’t venture too far out from the shoreline. As with Trawangan, visibility is constantly good year round. Expect to see Hawks bill and Leather back turtles, schools of Batfish, Blue-spotted stingrays and many varieties of hard and soft corals. If you look hard enough you could be lucky enough to find rare and unusual nudibranchs amongst other lesser-spotted micro critters. Enjoy sunset behind Gili Terawangan from Gili Meno. Gili Trawangan is the fastest and easiest access to visit this island because most visitors arrive via Gili Terawangan by boat hopper which only takes 15 minutes drive. The fastboat depart from Gili Trawangan at 09:30 and 16:00 every day and also from Gili Air at 8:30 pm and 3:00 pm (twenty-minute ride). If you depart from Lombok, you can use the public boat service from the Bangsal port who will take 25 minutes in journey. There is direct fast boat to Gili Meno, named Indrajaya Fast Cruise, Depart from Bali at 09.00am, and then to Gili Trawangan, Gili Meno, Gili Air, final stop at Lombok.